Because of one criminal, all the students at Penn State will be abused. Justice is not served py punishing the current crop of students at PSU. 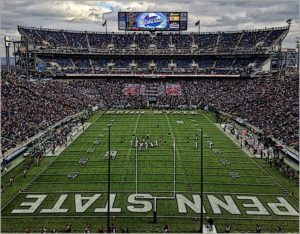 Penn State is being “nailed to the cross” to atone for the “sins” of all the big college football money machines in the hope that by destroying one program we (using the NCAA as a tool) can wash away the sins of all programs and thereby purge ourselves of the guilt we feel for enjoying college football. Jerry Sandusky is a sick individual and an incarcerated criminal. The people that enabled him, whoever they were, are individuals guilty of complicity to a crime. Punish them. It is always right to punish those responsible for perpetrating crime. Do so in a court of law where all parties have the right to introduce evidence and make arguments regarding their guilt or innocence. The victims of these crimes will never be made “whole.” Bad things sometimes happen to good people. The knowledge of this is one of the saddest and most tragic elements of our human existence. When it happens, we all feel pain. We want to do something about it, but we can’t. What was done can never be made right? Crimes are committed by individuals, not organizations. The ground, the buildings, nor the equipment of PSU committed any crime. It was the individuals involved that should be investigated and punished if found guilty. The handling of this scandal by the media is a reinforcement of the trend in this country toward disregarding personal responsibility. People committed these crimes. Those people should be punished, not the institution in general. But what the NCAA has done here amounts to a re-branding of a criminal case against a few sick individuals into an inditement against the “sins” of all big college football. Ironically the result is another brand of child abuse against the current crop of Penn State students. The current students, faculty, and student-athletes are in no way responsible for any of these crimes. Why are they being punished? The sanctions imposed by the NCAA will impact the entire university and the greater community for many years to come. Many innocent people will suffer real pain because of them. Students, faculty, and local businesses are only beginning to understand what is in store for them. Why should these people be punished for the actions of a few criminals? If the NCAA really wanted to make an impact on big college football’s “too big to fail” status at major universities, why not broaden it’s investigation so as to formulate rules to prevent teams from making so much money? Seriously, how is PSU different from Alabama, LSU, Texas, USC, or any other big football school? The reality is that the NCAA isn’t interested in “reforming” college football, it’s only interested in sacrificing one institution so we can all feel good about maintaining the status quo.